Spyderco's Endura has achieved near-legendary status in the world of everyday-carry cutting tools. The latest variation of this model combines all the best-in-class qualities of the Endura 4 Lightweight with the extreme cutting power and versatility of a Wharncliffe blade. Available in either a PlainEdge or SpyderEdge format, its VG-10 stainless steel blade features a full-flat grind for exceptional edge geometry that further accentuates the performance of its Wharncliffe profile. 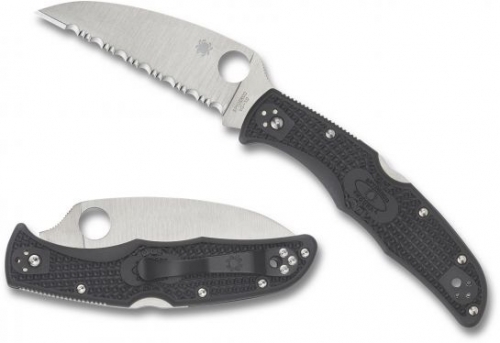 It also showcases a fully accessible Trademark Round Hole and is backed by a rugged back lock mechanism, skeletonized stainless steel liners, Bi-Directional Textured injection-molded FRN handle scales and a four-position pocket clip.